DVD Ripper properly reads the DVD but, has no option for exporting to Apple ProRes codec and the ability to modify or create custom presets seems to be very limited. Video Converter will output to ProRes but, does not properly read the DVD, it will only convert the individual VOB files. Obviously, this Mac DVD Ripper is not the DVD to Apple ProRes ripper that I am looking for so I have to wonder around if there is DVD ripper that rips DVDs to Apple ProRes? While I was ripping my DVDs to Innotab 3S/Max, I see Wondershare Video Converter Ultimate. Although it does not support Bluray disc, Wondershare works great for DVDs and I found a profile for Apple ProRes and guess what? It is working flawlessly and I assume Wondershare Video Converter Ultimate is the very DVD to ProRes ripper and you can also have it to rip and convert DVD disc to Apple ProRes for editing on macOS Sierra and High Sierra, Mojave even it is not a 64 bit DVD ripper at the moment. How to Rip and Convert DVD to Apple ProRes for Editing in Final Cut Pro? Please note Wondershare only works for DVDs instead of Bluray discs. While I just want to edit this single DVD in Final Cut Pro, there is no need for me to go for a Blu-ray Ripper. But if you do, go Leawo Bluray Ripper for Blu-ray ripping to ProRes on macOS. Please follow the below two buttons to download, install and launch Wondershare Video Converter Ultimate and put the DVD into your DVD drive to get ready. If you have your DVD saved to the hard drive instead of on the disc, click the drop-down menu to load from ISO/IFO or VIDEO_TS folder. Please be noted, while you add DVD IFO files, make sure the IFO files are along with associated VOB and BUP files, or you won’t be able to rip. You will then be asked to main or all movies. I’d like to recommend Main Movies Only for most DVDs. All Movies are recommended for TV shows or workout DVDs etc. Besides, if you are having trouble loading the DVD, check this guide for help. Step 2. Go to the drop-down menu of “Convert all files to” and go Editing tab, scroll down and locate ProRes for the output. Apple Final Cut Pro 7, Final Cut Pro X, Apple ProRes 422(Proxy), ProRes 422(LT), ProRes 422, ProRes 422(HQ) and ProRes 4444 are available for you to rip DVDs to. Pick up the one you need. Please note the profile for Final Cut Pro and ProRes is in the Video tab in the Windows version. You will see the predicted output file size is huge. 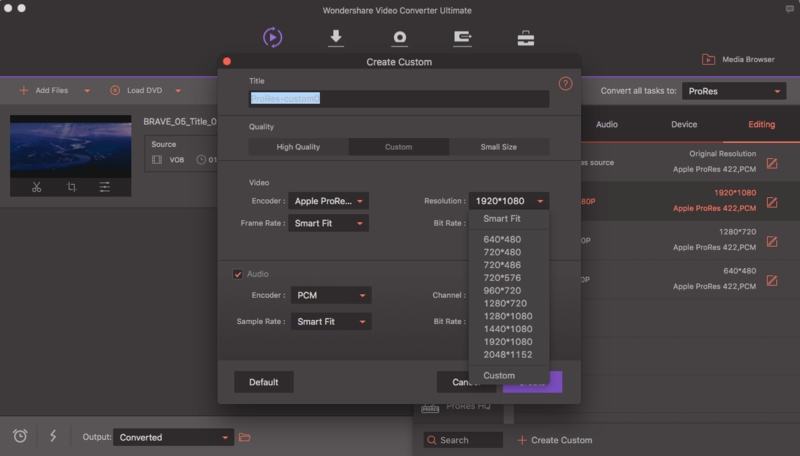 This is because Final Cut Pro requires high bitrate and the default resolution for the ProRes in Wondershare ProRes DVD ripper for Final Cut Pro X or 7 is 1280×720 on Windows version and Mac version offers 1080P HD resolution. Well, as far as I can see, this is actually too big for a DVD as the original DVD’s resolution is 720×480 for PAL and 720×576 for NTSC. So, I’d always go and set the resolution down to 720×486 or 720×576. You need to Edit as shown below to set the resolution. And, feel free to set the video and audio codec, bitrate etc and save the profiles as you own. Step 3, Also, I don’t always have to edit the whole DVD in Final Cut Pro. Most of the time, I just need a short clip and rip a short part of a DVD to ProRes. If this is your case as well, go to scissor button and cut or delete the parts. Step 4. You are free to set the output or merge different titles into one MOV file for ProRes. Or just click on the big Convert All button to start ripping DVDs to ProRes and after that, go and see how perfect the copy you get for ProRes! Wondershare names this nice and powerful DVD to Apple ProRes Ripper as a video converter, so actually you always need to convert videos in MKV, M2TS, AVI to ProRes as well and you are even able to batch convert videos along with DVDs! Wondershare Video Converter Ultimate is also a long YouTube video downloader and 360 VR downloader. You can use it as your all-in-one YouTube downloader and YouTube to ProRes video converter as well! So, enjoy the program! And, FIFA World Cup 2018 in Russia comes, Wondershare Video Converter Ultimate is able to download Russia World Cup videos, record World Cup 2018 live streaming, convert, edit and burn camera recorded World Cup 2018 videos, and you can even make GIF from your World Cup videos and photos. 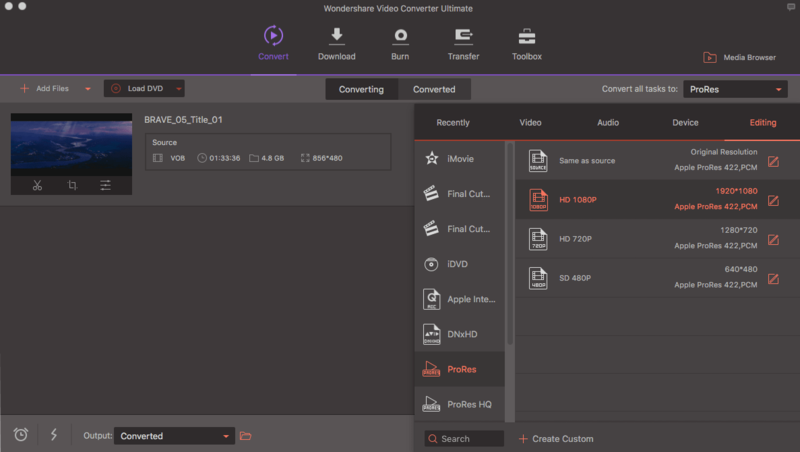 Wondershare offers a free trial and the trial version of Wondershare Video Converter Ultimate is restricted to convert only 1/3 length of DVD to ProRes. It is recommended to have a trial first and see how it works for ripping DVDs to ProRes you before you buy. Wondershare Video Converter Ultimate is sold at $59.95 for lifetime license but here I have 20% discount for you and you save $11.99. Also, you are able to save 20% for other Wondershare apps as well. Please note the discount is only available here. You may try use Avdshare Video Converter to Convert AVI to Apple ProRes on Mac. I was talking about DVDs! Also, Wondershare IS able to convert different videos to ProRess! I don’t need another tool to do so.